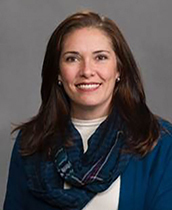 Shasta Helsel, MD, a native of Morristown, Tennessee, has returned to the area to serve the children of East Tennessee. She received her undergraduate degree from the University of Tennessee, Knoxville, and completed her medical degree at East Tennessee State University’s Quillen College of Medicine. Dr. Helsel performed her internship and residency at the University of Hawaii Integrated Pediatric Residency Program in Honolulu, Hawaii. Dr. Helsel is Board Certified by the American Board of Pediatrics and is a member of the American Academy of Pediatrics. She has been practicing pediatrics for 11 years. Her focus is educating children and teens on the importance of staying well and making lifelong healthy choices. She is married to LTC Bryan Helsel (Ret. ), MD, a cardiothoracic surgeon, and is the mother of two children. In her leisure time, Dr. Helsel enjoys spending time with her family, exploring new places, cooking and crafts.